Tile Doctor Aqua-Pro is an effective yet pH neutral tile and grout cleaner designed for every day use in bathrooms and kitchens. The neutral formula eliminates soap scum build-up and hard water deposits when used regularly. 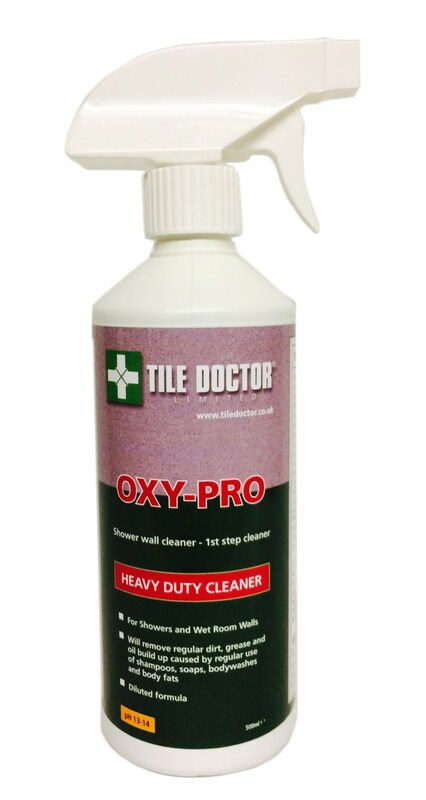 Tile Doctor Oxy-Pro has been specially formulated for cleaning shower tile and grout with a powerful high-alkaline formula designed to tackle soap scum, body oil, mildew and algae from areas that have been neglected or subjected to frequent use. Use on natural stone (such as Granite, Limestone, Slate, and Travertine), Ceramic, Porcelain, Quarry, Saltillo, Terracotta and Masonry surfaces. Avoid all skin contact. Wear rubber gloves and eye Protection. Sweep, vacuum, or wipe surface. Allow to dwell 3 to 5 minutes for cleaning. Agitate with scrub brush. Do not allow solution to dry on surface. PLEASE NOTE: Once dry we recommend Grout is protected with the application of a Grout Sealer. Approximately 10m² to 20m² (100 to 200 sq. ft.) per litre bottle depending on tile porosity. Available in 500ml bottles at £7.99 each, Postage and Packing £5.50 for 1 bottle, £10 for two or more bottles (All prices are shown inclusive of VAT).